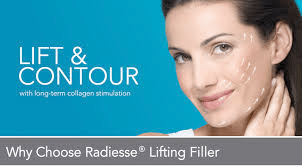 Radiesse can effectively be applied for deep wrinkle reduction, lifting, and contouring. Depending on your individual needs, Radiesse® helps to achieve a correction of single parts of the face or a full facial lifting with long-lasting effects. Radiesse is a collagen stimulator In addition to the immediate filling effect, the high-quality ingredients of Radiesse stimulate growth of our own natural collagen.2–4 Thanks to the collagen-inducing effect of Radiesse, the skin regains its youthful tightness and elasticity – our natural beauty blooms again. Collagen provides elasticity and volume. Collagen is the main structural protein of our skin and makes our skin appear firm and smooth. However, with age, natural collagen production slows down, so that our skin gets thinner and loses volume and elasticity. The consequences: Wrinkles develop and the facial features begin to sag – the whole face loses its contours. In addition to the immediate filling effect, the high-quality ingredients of Radiesse® stimulate growth of our own natural collagen.2–4 Thanks to the collagen-inducing effect of Radiesse®, the skin regains its youthful tightness and elasticity – our natural beauty blooms again. Has Radiesse been tested and certified? Yes, Radiesse achieved the CE certification, which is the European Union’s standard for product safety. Radiesse was also approved by the FDA (the American regulatory authority) in 2006.
session typically takes approximately 30 minutes. The effect will be visible immediately after injection. including aspirin and some vitamin supplements, can lead to unwanted bruising. Your practitioner will advise you accordingly. Most adverse events are injection-site-related and often transient reactions. Prior to treatment, your practitioner will inform you about all possible risks and potential adverse events that are listed in the Instructions for use. How long does the effect of Radiesse last? Individual results are dependent on age, skin type, lifestyle, and metabolism and, of course, the area treated. Generally, the effect of the treatment lasts over a year for most patients. I am afraid that the treatment might hurt. What can I do? 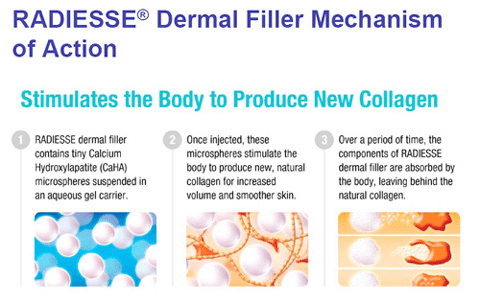 With the line extension product, Radiesse Lidocaine, Merz offers patients a new dermal filler that combines the proven efficacy and safety of Radiesse with extra comfort. Clinical data show that Radiesse Lidocaine significantly reduces pain during and throughout the first hour after treatment. The pain reducing effects of Radiesse Lidocaine can make your aesthetic treatment more pleasant and comfortable. Can Radiesse be combined with other products? For a holistic treatment of individual folds and selected areas of the face, it may be advisable to combine Radiesse with other products from the Merz Aesthetics portfolio. Please ask your practitioner which treatment option is best for you.